Pasta Nuovo took over the old Tutto Pasta spot in Middleton a couple months ago. I was kind of disappointed that my neighborhood was getting another Italian restaurant instead of a good Mexican restaurant or casual deli, but figured I should give it a chance. The inside was cozy and open, but it was a beautiful night so we sat outside on the patio. A restaurant definitely gets extra points with me when they have outdoor seating. I want to start with the one reason I won’t be going back to Pasta Nuovo for a bit. The service here was awful. Our waiter was inattentive, arrogant and a little inappropriate. The other waiter serving on the patio filled our water glasses more than our waiter. Our appetizer and entrees were brought out by two different people other than our waiter. Our waiter spilled an entire bottle of beer on the woman behind us. He disappeared the entire time we were eating our entrees. He also told us about the two times he lost his credit card and had his identity stolen and how dumb he felt when that happened the second time. The cherry on the top of being a terrible waiter was when he condescendingly told me he would take care of my coupon after he didn’t take care of it the first two times I asked. The woman who brought out our appetizer and the other guy serving on the patio seemed like very nice and competent servers…maybe we just got the cream of the crop! I found a coupon for $10 off the purchase of an appetizer and two entrees so we started with the bruschetta. It came out on a large chunk of pizza dough, which was different than I have ever seen. The menu said it was topped with an heirloom tomato basil salad. 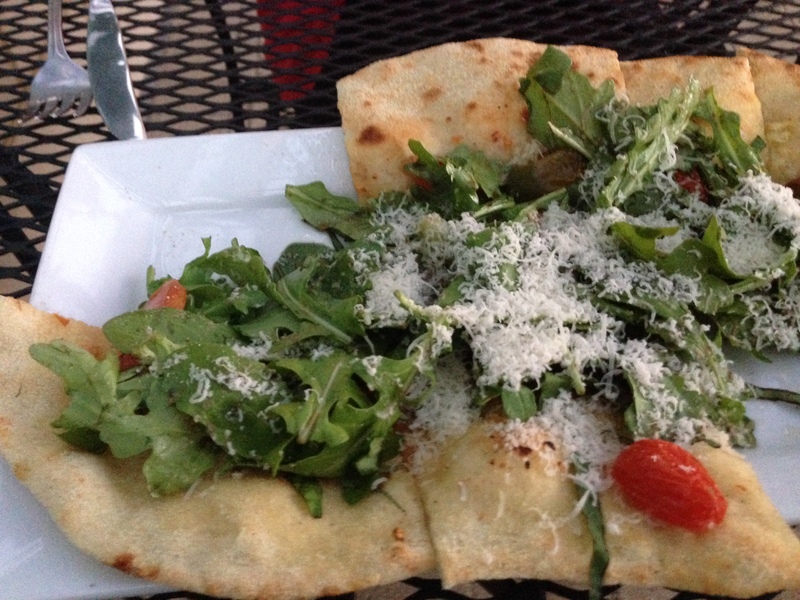 The description was a little misleading because the stuff on top of our pizza crust was halved cherry tomatoes, a couple slices of basil and a ton of arugula. Everything was really fresh but the dish was definitely lacking in flavor. The flavorless pizza dough with cooked tomatoes and peppery arugula would really benefit from some balsamic vinegar and either mozzarella or Parmesan cheese. Also, the tomatoes were in such big pieces only one out of every two or three bites actually had tomato in it. Chopping the tomatoes up into smaller pieces would make it better. They have a couple of non-pasta options for entrees but since they make the pasta in house I don’t think there was any questions that we wouldn’t get pasta. 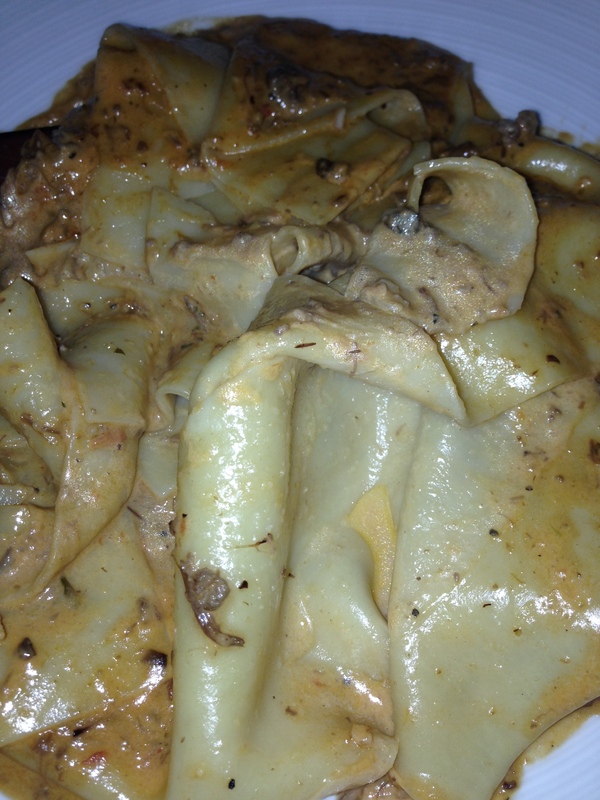 I got the pappardelle bolognese and was extremely happy that I did. The pasta was so fresh and was cooked to a perfect al dente. The bolognese sauce was, in one word, amazing. It was creamy and hearty but not too heavy. I think what made the sauce special was that it had a little bit of cream in it. Most bolognese sauces are strictly meat based and this one stood out from the crowd with the creaminess combined with the traditional hearty flavors of a bolognese. My mom got the tomato basil angel hair pasta. The pasta was also just as amazing as the pappardelle and the accompaniments were very fresh. 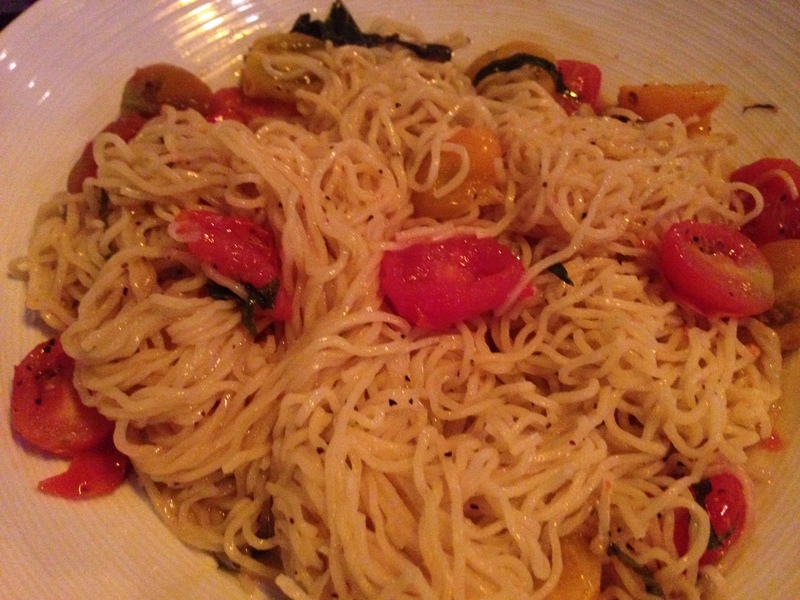 The tomatoes were perfectly cooked and plentiful, and the sauce a perfectly sparse buttery drizzle with basil on top. It was very different from the pappardelle bolognese but an extremely flavorful version of buttered noodles. Both were a great choice. FOODNOTES: The location is a plus for me and I loved the outdoor seating. The portion sizes were plentiful for the prices. Our server was terrible so I will be giving them some time to weed out the bad servers and assemble a good serving staff. Unless there are changes made to the bruschetta I probably won’t be getting it again. As amazing as the bolognese was there’s another dish on the menu I want to try. Next time I go I will be getting the roasted beet pasta. It is fresh beet and spinach fettuccine with roasted beets, goat cheese and pine nuts drizzled with olive oil. I don’t like the flavor of goat cheese but they said they would substitute Parmesan and I think that would be a great substitute. I would suggest getting the bolognese during your first trip and I will definitely update you on the roasted beet fettuccine dish. I also plan to check our their dessert options next time.